Q1. What have you been up to since you left your job? Saying, ‘I’ve had a chance to catch up on all the chores to do around the house’ is not a good interview answer. An organisation wants to employ people who are energetic, self-motivated, and determined. The longer you have been out of work the more important it is for you to show that you have managed your time well. This might mean volunteering for work where you can use your skills and abilities, attending courses so that you upgrade your skills, and being active in a business or professional network. Q2. How long have you been looking for a job? Unfortunately it is true that the longer you are out of work the more difficult it is to be offered a job and you lose interview self-confidence. With this popular interview question the potential employer wants to know whether there something wrong with the candidate that has been out of work for a long time. When there’s a chance that you might be ‘out of work’ for a considerable time it is important to give yourself a deadline and then consider taking a job which might be a contract position, or a job in another area of the country. Even consider a job where you’re over qualified. All jobs at every level can be used to promote a candidate so don’t feel that taking a job below your qualifications means that this will be held against you in the future. Being seen as a pragmatist and a hard worker will help you to stand out against the competition for a job. Q3. Why do you want this job? This is a very popular interview question but saying, ‘because you saw the advert is not a good interview answer’, even if it’s true. It’s a buyers market and a potential employer wants to employ a person who is keen and enthusiastic to work with them. If they find a candidate who’s genuinely interested in their company then they believe that they’re more likely to stay and succeed in the new job. The candidate who prepares for the interview by reading up on the organization and demonstrates an understanding of their strategy, management team and current issues is more likely to capture the interest of the interviewer. Find something specific about the company that complements your own experience and ambitions. It is even more impressive if you’ve ‘gone out of your way’ to understand the organization such as talking to other employees or their customers. Q4. What do you consider to be you greatest achievement? In an interview, candidates tend to smile and nod a lot. The potential employer is interested in getting to know the ‘real’ you and whether you’re going to fit within the culture and role of their organisation. Asking about your achievements is a popular interview question. The achievement you choose to talk about says a great deal about you and your personality. A good interview answer is to choose an accomplishment that relate to the position you’re applying for. If this isn’t obvious pick an accomplishment that required some of the same strengths that will be needed for the job. If you’re applying for a leadership position in a task goal orientated culture then the interviewer is going to be impressed by someone who is motivated by achieving a project or goal and inspires others around them. In an entrepreneurial organisation a ‘creative mind’ will be more appreciated. The ability to ‘think on one’s feet’ will be considered critical to a high level of success within their organisation. Q5. What salary did you earn in your last job? Companies will frequently find different ways to ask an interview question to determine the candidate’s salary requirements. Your last salary is a good way for them to determine whether they can afford you. If the salary the organisation is offering is considerably lower than your previous salary they’ll have concerns over whether you will stay in the job. If this is the case, then a good interview answer is to convince them that you are prepared to live on a lower salary and why. Sometimes, companies will ask the candidates, ‘what salary do you require? If this is too high for their budget they will look at other applicants. 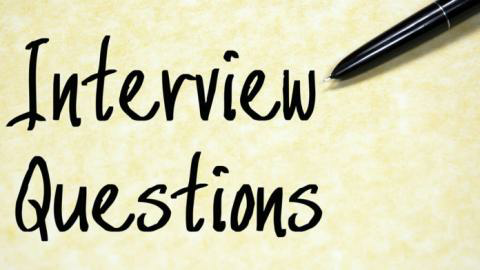 A good interview answer is to say that you are willing to start on a lower salary with bonuses driven by targets. This gives them savings on their budget and a safety net if the candidate does not achieve as well as expected. Q6. what do you think is your weakness? One of the most important tasks of the interviewer is to find a candidate who they would like to work with and who is likely to get on with other people in their organisation. Candidates often try to answer this popular interview question with a positive trait disguised as a weakness. For example, ‘I’m a bit of a perfectionist’ or ‘I tend to work too hard and expect others to do the same’. An interviewer is looking for someone who has a level of maturity and self-awareness as this is an important trait for creating empathy and working with people. To stand out from other candidates a good interview answer is to mention a genuine weakness, and then emphasize what you’ve done to overcome or manage your weakness. This is evidence of a truly confident person who takes personal responsibility for themselves. Q7. Give me an example of when you found working with someone difficult? By asking this popular interview question, the interviewer is acknowledging that we can all have a problem working with people some of the time. This is a popular question for revealing any prejudices that the candidate might have. Today it is essential that an interviewer employs a candidate who is comfortable working with people from a diverse range of ethnic, cultural, ages and religious backgrounds. A good interview answer would be to mention a specific person who you found difficult to work with rather than a group of people. Give a specific example such as a person resisting change on one project. Importantly, demonstrate the difficulty and how you resolved the issue. Q8. What will you be doing in five years time? Ambition and drive are great qualities in a candidate as it demonstrates energy to persevere and reach goals even in tough times. However, an organisation also wants to see signs of stability and loyalty to employers. If your CV shows that you’ve moved every eighteen months or so the interviewer is likely to need reassuring that you’re not going to ‘jump ship’ to a competitor in a year from now. A good interview answer is to talk about the opportunities you’ve researched within their organisation and your ambitions to excel within it, particularly if you can refer to employees within their organisation. Setting Clear Objectives before you go for an interview is useful otherwise you can waste time applying for jobs you’re unlikely to get. Q9. Why are you the best person for the job? As with answering all the other popular interview questions try and appear confident and likable. A poor interview answer is to just say that you’re better than any of the other candidates. You don’t know the qualifications or experience of the other candidates! A good interview answer is to focus on three to five specific reasons why you should be hired and briefly substantiate your claims. Remember, to tell the interviewer that you’re really enthusiastic about being offered this job and determined to demonstrate the contribution and value you can make to their company. Knowing how to sell yourself is an interview is very great interview skill. Q10. Is there anything you want me to ask you? Many firms now ask a similar open ended question. This is not a trick question but just gives the candidate a chance to speak on their own behalf. If you think that there have been any problems in the interview, this is your chance to go back into an area which you think the interviewer may have doubt about you. It is not a good interview answer to say, ‘no’ as this can show that you’re not interested in the job. It can also give you a chance to reiterate a strength which you think is important and might distinguish you from other candidates.